There is something surreal about driving up the winding road in Morrison, CO to get to Red Rocks. The hillside surrounding the actual amphitheater is littered with massive rocks, making it difficult to distinguish where the amphitheater sits in relation. As you ascend the winding road, the view passing through the natural stone tunnel, is wondrous. Even from the road you can look out and see the entire city of Denver and the surrounding suburbs. The mountains are nestled behind the amphitheater, peaking out to the left, a reminder of the Earth’s natural processes that gave rise to such a place. 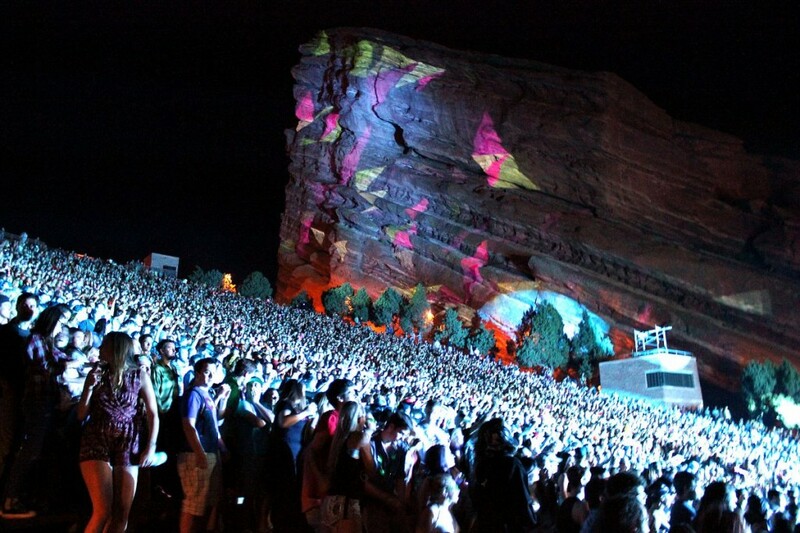 The first time you go to Red Rocks, there are a few rituals you should practice. Because with these small rituals, you are privy to one of the most beautiful landscapes and the only venue that nature has to offer. The top parking lot is always crowded, but worth the journey to the top. Your first time at Red Rocks should be spent climbing to the top of the stairs where you will stand, out of breath, laughing and smiling with some of the best people in the world. When you get to the top of the amphitheater you should head directly to the railing that overlooks the crowd and the stage. Usually I arrive shortly after doors open, when the crowd is milling around the seats, the sunlight quickly fading behind us. The absolute best part is standing at the railing and gazing out. If you get there early enough, the sun begins to set behind you and what meets your eyes is something beyond dreams. The skyline of Denver is seen almost due east, the skyscrapers towering over an otherwise flat landscape. The many lakes and reservoirs that dot the open space can all be seen from the top; the blue of the water reflecting the last rays of the sunset as a shimmer. As your eyes slowly descend from the landscape surrounding Denver, the stage and the natural rock that forms the amphitheater comes into view. The red sandstone surrounds you, encasing you in the history of the last 250 million years. The two monoliths that tower over you complete the scene. Creation Rock and Ship Rock as they have been named. When you are in the crowd and you turn around to look behind you, the monoliths dominate your vision. It isn’t the type to overwhelm, though you certainly feel small as the 300 ft of red sandstone never seem to end. The rocks envelope you, creating a single unified atmosphere; there is nothing more perfect than that moment. Each time I have attended Red Rocks I make a point to stand in the middle and turn around. I don’t care who is playing, what song it is, or what my friends are doing. That moment is the culmination of 250 million years of natural processes infused with the music of the modern world. 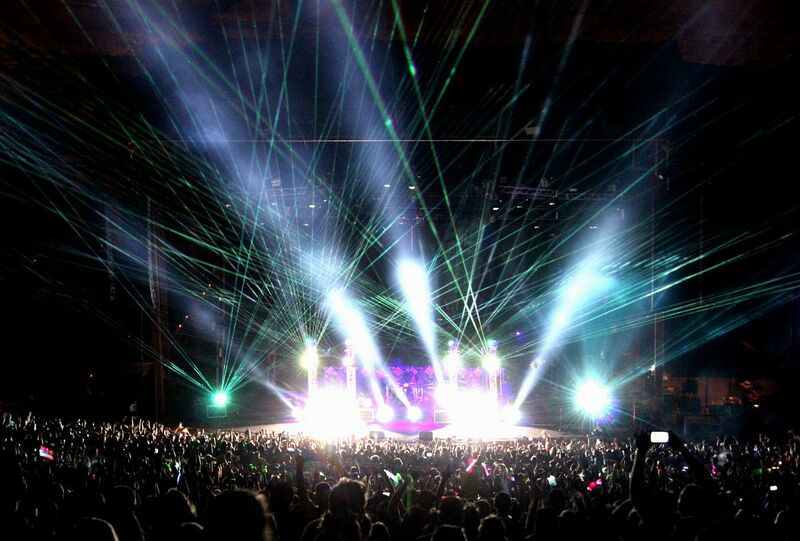 Red Rocks Amphitheater is a dream venue for many artists. If you ever get the chance, I encourage you to take a tour of the amphitheater that reveals many more secrets. Backstage is where the magic all begins. The artist dressing rooms vary in size; especially the headlining act whose dressing room includes an entire wall carved from the red sandstone. The best part however is the artist tunnel. It leads from near the dressing rooms up to the stage. Ordinarily it would not be anything of note, though in the picture below you can see what makes this tunnel memorable. Every artist, Dj, band, act, anything, have put their names on the walls of Red Rocks. They have written themselves into the history of the amphitheater with only a marker. 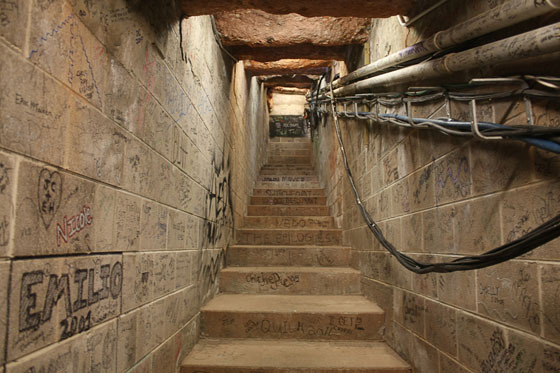 Their shows have been legendary, but as you walk up the tunnel’s stairs, the incredible history of Red Rocks comes alive with each step. The flutter in your stomach as you ascend the steps echoes the same that artists get as the prepare to go on stage. Even though there is no guitar or mic in your hands; the walls breathe a performer’s life into you. Then, when you reach the top, Red Rocks is your home and you are the reason there are 10,000 people clamoring for your presence.